Are you searching for a Bible study that is serious about the Word, yet fun and full of action? Do you want a study that doesn’t end when the last page is finished? Are you looking for a catalyst that propels you into action and changes your behavior to be more sweetly delicious to God and others? If so, Sweetly Delicious, the Bible study, in coordination with the book What Kind of Chocolate Are You? by Becky Baxa will be a sweet experience! This delightful journey digs into scripture with creativity and uniqueness. It is a study that will challenge you, making scripture become real; and turn learning into action that affects daily life. 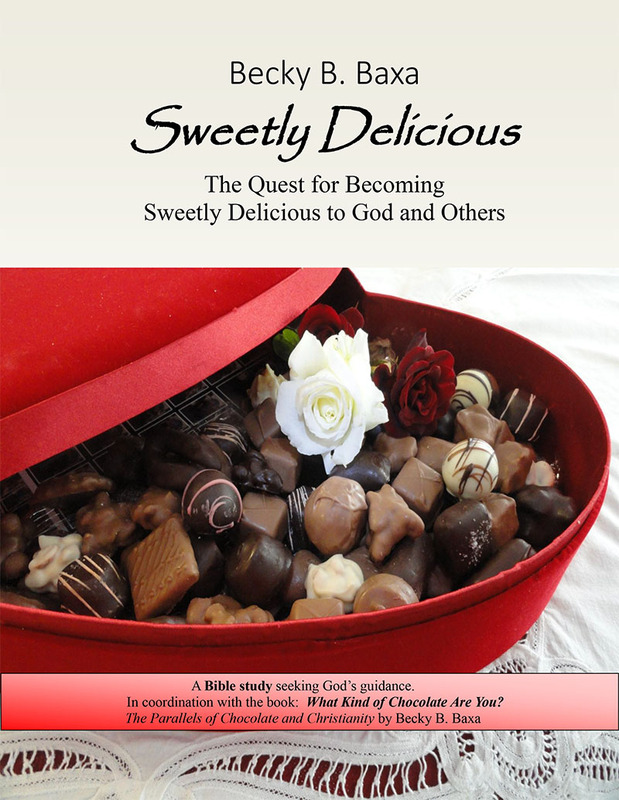 Quantities of five or more books of the Bible study Sweetly Delicious may be purchased at a discounted price of $10 each from Hidden Splendor, by contacting us here. Blessings to these women… the first group to begin Sweetly Delicious Bible study since its release to the public. We are praying that you have a wonderfully sweet journey through the Scriptures! Get free access to our collection of Bible Study materials that accompany this book! "The Bible study was just what I needed. I loved the personal stories that you shared and getting to meet new friends. Your friendly, out-going personality really kept everyone involved. I liked that you included us throughout each session by having us participate. For me personally, it was just what I needed. I really felt compelled to attend in the first place and the sessions left me feeling replenished and refreshed, reminding me of the importance of God in our daily lives"
"I liked the real life examples best- your mission trip to China and ways you try everyday to be a witness for Christ. The scriptures tie into the lessons from your real life experiences so well. It was inspiring as in today's world we can get so wrapped up in the mundane details and easily forget about being "sweetly delicious" following God's way." "This is a thought provoking and fun study. Becky's joy for the Lord and life is inspiring. I enjoyed learning about how Christ molds us to be "sweetly delicious" and the similarities to how chocolate is made. I hope there are more studies like this one." "I was so encouraged by all the scripture and activities. I felt loved by God and equipped to go out and make a difference loving people around me every day and whoever I might meet." "Every week was a blessing!" One participants description: This study parallels our Christian walk with the process of making delicious chocolate. It is an adventurous walk through scriptures that will help you love others intentionally and extravagantly. Each week of the study, you are challenged to go out and act on what you learned. In the last lesson, you will complete your action plan for the next year. You will be blessed and bless others! I love that this study included different activities for all different types of people.